Crush digestive biscuits, mix with butter, divide and press into 2 serving cups. Beat cream cheese and whipping cream. Add icing sugar, vanilla extract, orange juice and orange rind and mix it together. Spoon it into the cups. Close cups with cling wrap and leave it in the refrigerator. 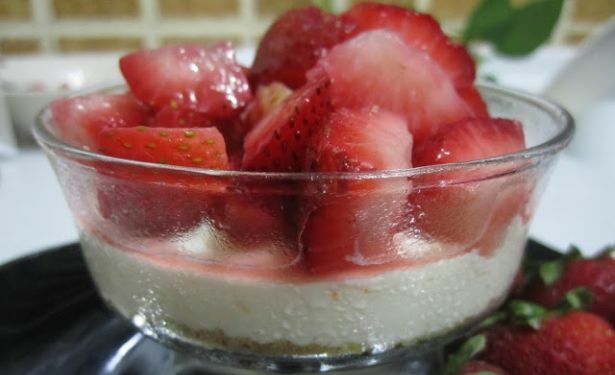 Cut strawberries and mix them well with castor sugar and keep it in the refrigerator. When you are ready to serve, bring out the cups, top it with the strawberries. Note: You may add some dissolved gelatine powder (in warm water) to the cream cheese mixture before refrigerating if you prefer a firmer consistency. Double the recipe as needed. Reshwani’s blog can be found www.daily-cuppa.blogspot.com.